WE HAVE A VERBALLY-ACCEPTED OFFER; WE ARE WAITING FOR THE SIGNED DOCUMENTS. Impeccably maintained home located on oversized 105 x 160 lot. Enjoy privacy & tranquility in this 3 bedroom, 2 bath home. This beautiful home has an open floor plan and very spacious bedrooms. This home has many extras, heated salt water pool, new pool cage no-see-um screens in 2017. The A/C with 2 zones is covered by a service agreement. Radiant heat barrier, wireless security system, central vacuum, surround sound in living room, Manabloc plumbing controls, & 8-zone sprinkler system fed from 2 wells are just some of the features this home has to offer. The spacious kitchen will be a joy to cook in, with an island, a breakfast bar and ample cabinet space. The large master bedroom offer a spacious walk in closet, and tray ceiling. The master bath has his & her sinks, walk in Roman shower and a separate soaking tub. 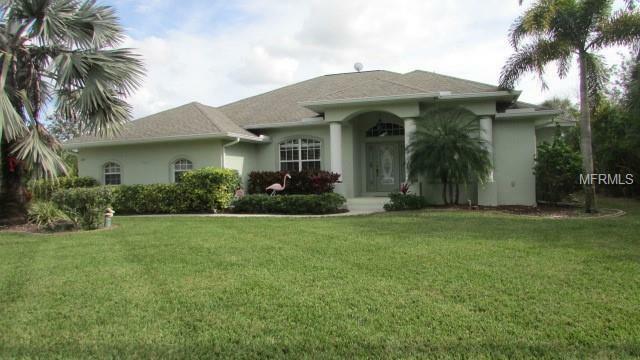 The home has 4 sets of sliders as well as the guest bath that opens onto a large lanai & pool area. New pool heater in 2015, new washer, dryer and refrigerator in 2018. New water softner and purification system in 2015. This is a must see home!